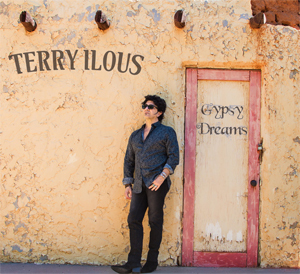 Terry Ilous, lead singer for the band GREAT WHITE and founder of 80's metal band XYZ, is premiering his third solo venture, Gypsy Dreams, on Friday, April 28th, 2017. A video trailer for the album can be viewed below. Terry Ilous relocated to Hollywood, California from Lyon, France in 1986 forming the metal band XYZ along with friend and bassist Pat Fontaine. Ilous quickly became a favorite on Sunset Strip scene in the late 80's before getting signed to Enigma/Capitol Records. After selling over 1.5 million records worldwide and touring with artists such as FOREIGNER and ALICE COOPER; Ilous has continued to release albums well into the 2000’s along with film, song-writing, and television work. In 2009 Terry was contacted to play a handful of dates with multi-platinum recording artists GREAT WHITE; who are one of the few bands of that era to still be consistently touring to sold out shows. In 2011 the line-up was made official and GREAT WHITE immediately headed out on an extensive year long tour followed by a new album in 2012 that was highly praised by the media & fans alike. With the song "Hard To Say Goodbye" reaching #8 in the Billboard Radio Chart. Currently Ilous has been finalizing his latest project, Gypsy Dreams, a cover album of classic rock and hard rock favorites with a Latin and flamenco edge. The album features an amazing cast of L.A. based artists including, [Grammy nominated artist ] on Guitar, Jose Garcia [vocalist, renowned flamenco guitarist] on Guitar, Chris Trujillo [former percussionist for TOTO, BLACK CROWESm] Drums / Percussion, Al Velasquez [BIG BAD VOODOO DADDY, Michael McDonald, Albert Lee] on Drums/Percussion, Mike Paganini - [renowned session player, Bassist] on Bass, Ben Woods - [renowned flamenco guitarist w/ BENISE, HEAVY MELLOW] on Guitar, Mike Bennett [Alicia Keys, Pitbull, Ritchie Kotzen] on Drums/Percussion, Jesse Stern [George Clinton, Chad Smith] on Bass & Natalie Gelman [singer / songwriter] on Background Vocals. Terry on recording “Long Train Running” - "In the late 80's I would warm up with "Long Train Running" while on the road with XYZ; and for years I wanted to record the song with more of a Latin edge." He adds: " This has been a long road, but the final tracks sound truly amazing, and are definitely worth the wait. I thank all my fans & band for being a part of this journey and for all your support along the way, I couldn't have done it without each and every one of you." Gypsy Dreams is slated to be released Friday, April 28th, 2017 via digital format on iTunes. The physical copy will be arriving in May 2017 on Terry Ilous' private label, Fyco Records and can be pre-ordered HERE.